St Andrews Verandas Highland Woods Condos: There might not be a better view in all of Highland Woods. This second floor Abbey has amazing lake and golf course views. This is one of two buildings in Highland Woods that has southern exposure and offers more natural light than most units. Being sold turnkey furnished this unit has a new a/c, wood cabinetry, solid surface countertops, and much much more. Highland Woods is one of the best bundled golf communities around. Perfectly situated right across from the Promenade in Bonita, you are only four miles to the beach, and you also have dining/shopping right outside the community gate. Highland Woods recently underwent a community wide transformation. The clubhouse, fitness facility, and golf course were completely renovated. If you enjoy playing golf, social events and being close to everything, then Highland Woods is the place for you. Call and schedule your showing today! Terrace Ii Highland Woods Condos: C.16130 - Not your ordinary 2/2 condo! This place will blow you away. Golf course view of 8th fairway. Total renovation done in 2014 with top of the line everything. I'm listing the special items due to space restraints. Can be SOLD turnkey with right offer. Solid core wood doors; Busby cabinets; granite in kitchen and master bath; Quartz counter top in guest bath; custom shutters; remote shade with 5 panels; induction cooktop; new water heater; air conditioner; new tiled floors; new carpeting; new front door with glass insert. All new light fixtures and ceiling fans. St Andrews Verandas Highland Woods Condos: Golfers’ delight! Offered turnkey, this second-floor condo boasts a light and bright two bedroom/two baths with volume ceilings in this bundled golf community at Highland Woods. Perfect for vacations and/or rental. One-car detached garage provides extra storage while you are away. Connect indoors with outside with two screened lanais, giving you additional options to enjoy the outdoor space. Serene water view is perfect for enjoying morning coffee or relaxing in the evening. Spacious open floorplan is perfect for entertaining. Centrally located near The Promenade in Bonita, you’ll have access to lots of shopping, dining, and the beautiful beaches nearby. Inside the community enjoy lots of amenities like, bocce, a clubhouse, pool/spa, fitness center attended, golf course, library, restaurant, and more. Close proximity to airport for visitors as well. St Andrews Verandas Highland Woods Condos: C.15550 - You will love how close this veranda is to offices, restaurants & the finest shops – yet tucked away for quiet and relaxation in Highland Woods Golf & Country Club! Cozy and carefree 2 bedroom, 2 bath plus den comfort with sliders opening to a front screened veranda and a rear screened balcony. SW rear exposure provides the best sunset views you could imagine! Private bedrooms, open floor plan and steps to the neighborhood pool which is the only screened pool in the development. There are 6 other heated pools, state of the art fitness center, restaurant, grill room, stunning club house, tennis courts and more! Highland Woods is a bundled golf community with lush landscaping, newly renovated features and great neighbors! St Andrews Verandas Highland Woods Condos: Light, bright, and airy is exactly what this two bedroom and two bathroom plus den condo has to offer. This Barrington Veranda is in fantastic condition and ready for you to move in and make your own personal touches to it. Being sold turnkey this unit offers a detached one car garage, vaulted ceilings, granite countertops and lovely views of the 17th hole and big lake at Highland Woods. If location is what you are looking for then you are in the right spot. Highland Woods is located close to everything. The Promenade of Bonita Springs is directly across the street, which provides shopping, dining, and entertainment. During season there is also a farmers market every Saturday at the Promenade. Bonita Beach and Barefoot beach are a short 5 minute drive away and Coconut Point Mall is also right up the road. Highland Woods is one of the best bundled golf communities around. Golf, tennis, bocce ball, fitness, and weekly social events will keep you busy all season long. Come see what this Barrington Veranda and Highland Woods has to offer before its too late! St Andrews Verandas Highland Woods Condos: The lake and golf course view from this second floor Barrington Veranda condo in Highland Woods is a must see. Enjoy this open floor plan which starts with a screened in front lanai and stretches all the way to the rear screened lanai overlooking a beautiful lake and the 8th green. This unit boasts vaulted ceilings and offers two bedrooms plus a cozy den and two full bathrooms. There is a one-car detached garage with plenty of overhead storage space. Highland Woods is a bundled golf community with 18 Championship golf holes, a state of the art fitness facility, tennis courts, bocce courts, a recently renovated dinning room and grill room. You will also be able to enjoy the large community pool and a cabana. Highland Woods is located across from the Promenade Shops in the heart of Bonita Springs which offers plenty of shopping, dining, and night life. The community is also located minutes from the world class beaches on the Gulf of Mexico. St Andrews Verandas Highland Woods Condos: Welcome to this beautiful second floor two bedroom / two bathroom Carlton Model Veranda in the spectacular bundled golf community of Highland Woods. Light, bright and airy this veranda would make a great vacation home or a lovely rental property. Stunning water ad golf course views, updated master bath, luxury vinyl floors, stainless steel appliances, high-end Hunter Douglas blinds are just a few things that make this veranda the right spot for you. Highland Woods is one of the nicest bundled golf communities around. Located directly across from the Promenade in Bonita, you are close to shopping, dining and entertainment. Also roughly 3-4 miles to Bonita Beach or Barefoot Beach you can be dipping your toes in the warm waters of the Gulf of Mexico in no time at all. Highland Woods also went through an extensive renovation to the Clubhouse, golf course and a brand new state of the art fitness facility. Everything is brand new and waiting for you to come and enjoy. Schedule your showing today before its too late! St Andrews Verandas Highland Woods Condos: This is the Carlton Model with a "Killer View"... looking across the lake to the Country Club Grounds via a fountain that’s in the middle of the lake! To your right is the Par 5 #17 green. There are a lot of recent upgrades: $8000 herringbone carpet that is two years old, $2200 plantation shutters throughout, $2000 roller shades at both lanai sliding doors, a heavy cast iron table with 4 chairs on back lanai, new screens and doors on both lanais, kitchen and wet bar with grey granite counters, great room and kitchen both with high vaulted ceilings, master bath handsomely updated, two utility rooms, two lanais so you can choose sun or shade, and a single car garage just steps from front lanai. The maid left yesterday so it’s ready for you to move right in! St Andrews Verandas Highland Woods Condos: Come and treat yourself with a full golf membership and a second floor 2 bedroom, 2 bath, split bedroom floor plan with detached garage. Enjoy lovely waterfront views of the 2nd and 7th holes on the privacy of your lanai. Highland Woods is amenity rich community with abundant social activities, state of the art fitness facility, 8 heated community pools including the clubhouse pool & spa and an active tennis program with 4 Har-Tru tennis courts. The Gordon Lewis designed championship golf course is a player friendly par 72 layout. Outside of the gates you have everything you need. Only four miles to the beautiful beaches of the Gulf of Mexico, The Promenade of Bonita is directly across the street, so all of your shopping, dining and entertainment is walking distance away. Coconut Point Mall is right up the road as well. If convenience, top notch amenities, and a very friendly community is something you are looking for then Highland Woods should be at the top of your list of communities to see. St Andrews Verandas Highland Woods Condos: Click on the link above to watch the cinematic tour! Overlooking the golf course, this lovely condo offers Florida living with touches of luxury, and access to great amenities. Set within the gated community of St. Andrews Verandas at Highland Woods, this two bedroom, two bathroom, first floor unit gives you lake views, a one car detached garage, and ample natural lighting throughout. Some key features include the front AND back lanai, as well as a generously sized living room with dining area. The light and bright kitchen boasts a suite of appliances and plenty of storage space, along with a breakfast bar and dining nook that provides direct access to the lanai. The cozy master bedroom features lanai access and bay windows, including a private ensuite with walk-in shower. Highland Woods offers an impressive list of amenities, such as a cabana, community pool/spa, clubhouse, fitness center, golf course, and tennis court as well. Set within the heart of Bonita Springs, this condo is close to great restaurants, shopping, and some of Southwest Florida’s most desirable beaches. Schedule your showing today before this is just another unit, SOLD! Terrace Iv Highland Woods Condos: Take a look at this lovely first floor two bedroom, two bathroom plus a den Colonade Model Terrace in the bundled golf community of Highland Woods. This unit has great views of the lake and green on the 8th hole. The property has been updated with corian countertops, tile floors, refaced cabinetry, plantation shutters, fresh paint and much much more. Highland Woods is a spectacular bundled golf community located in an amazing location. The Promenade of Bonita Springs, the beach, Coconut Point Mall, the shoppes at Mercato and RSW airport are all short drives away. Highland Woods is an amazing value offering golf, tennis, bocce ball, a state of the art fitness facility, a restaurant and bar, an extremely active membership, and possibly one of the best locations around. You will struggle to find a better deal in town. Come see what this condo and Highland Woods has to offer before it is too late. Terrace Ii Highland Woods Condos: Bundled golf community. Beautiful sunset views from this 1st floor condo overlooking the 7th fairway. Classic and Contemporary finishes in this updated condo. All updates with the last 3 years. Hardwood floors in all living areas. Top of the line Samsung stainless steel appliances including large French door refrigerator, regular/convection self cleaning oven, microwave and dishwasher Whirlpool Cabrio glass top extra capacity washing machine with no agitator and deep stainless steel drum. Mission style white kitchen cabinets with soft close hinges. High end Minka fans in living room and kitchen with remote controls. Kitchen island has been cut down to be same height as sink. Granite counters in kitchen. Custom height vanities in both baths with quartz counters, moen faucets and shower heads. Newer energy efficient A/C and hot water heater. Beautiful round Bernhardt glass dining table. King mattress one year old. One year old no seeum screening on lanai. Two HD Tv's including a 50" 4K in the living room. Currently the only Terrace building that has received a Check from insurance company for roof replacement. Terrace Iii Highland Woods Condos: C.15482 - Watch the sunsets over Highland Woods Golf & Country Club from the balcony of this 2 bedroom, 2 bath, end unit condo! Offered ‘turnkey furnished’ and ready for your special touches. Highland Woods is cleverly tucked away and is truly a hidden gem. As a ‘bundled golf community’, golf and all the other amenities are included as part of your association fees. Don’t golf? Not a problem! There is bocce, tennis, swimming, cards, dancing,exercise facilities and many other community functions going on every day in the renovated Clubhouse,community rooms and Fitness Center. You will not be disappointed! Short drive to the beaches, great shopping nearby and an incredible view that goes on forever. Please let me show you the best in life starting today! St Andrews Verandas Highland Woods Condos: Recently renovated Highland Woods County Club and golf course, in addition to bundled golf, offers the country club living you want with a community pool and spa, fitness center, restaurant and bar, bocce courts and tennis all at an affordable price. This charming CONDO with a one car detached garage is the best deal you will find in the community, as the owner is eager to sell. The lanai and the master bedroom have spectacular views of the fairways and the lake. Terrace I Highland Woods Condos: Gorgeous! That's what this top floor two bedroom two bathroom condo in the Terraces of Highland Woods is. There is literally nothing you need to do. Wood floors, newer carpet in the bedrooms, refaced kitchen cabinets, crown molding, new a/c, storm shutters, and an AMAZING sunset view! Plus, its being sold turnkey!!! Highland Woods is a one of the best bundled golf communities in the area. The community recently underwent a major renovation by redoing the clubhouse, renovating the golf course and adding a new state of the art fitness facility. Did I mention you are only 4 miles to the beach as well? Highland Woods is conveniently located to everything! Shopping, dining, entertainment are all right outside the gates, as well as Coconut Point Mall and the shops at Mercato less than 10 mins away. A beautiful condo, in a beautiful community in the perfect location. What more could you want? Call to schedule your showing today!! Terrace Ii Highland Woods Condos: ELEVATOR + BUNDLED GOLF + ENDLESS CLUBHOUSE ACTIVITIES + BREATHTAKING SUNSETS + STORAGE ROOM + GUEST PARKING + PET FRIENDLY + SCENIC WALKING PATHS = PERFECT FLORIDA CONDO Come for the Bundled golf and stay for the view in this beautiful resort community in Bonita Springs. You will love this second floor condo with great western exposure views of 8th fairway, Gordon Lewis bundled golf course and landscaped areas! 2 Bedroom, 2 Bathroom, formal dining room, great room, spacious bedrooms, breakfast nook, and screened lanai, covered carport and extra storage unit. The kitchen is white on white with a breakfast nook that overlooks the golf course. This condo is located in an established gated community, with a breathtaking clubhouse. This property would be a great investment as the golf membership is transferable to a tenant. Beach enthusiasts only a short ride to the white sandy Bonita beaches or enjoy the rich community amenities... clubhouse, pool, spa, restaurant, tennis, bocce ball, fitness and golf. Quick access to I75, midway between Estero and Naples and 15 minutes to the RSW airport. Terrace Iii Highland Woods Condos: This lovely two bedroom, two bathroom Brookside model condo in the Terraces of Highland Woods is your little piece of Paradise. Being sold turnkey furnished this condo has a little rustic feel to it. Laminate flooring, fresh paint, and tastefully decorated you can move right in to this condo and start living the Florida lifestyle. Highland Woods is an amazing value offering golf, tennis, bocce ball, a state of the art fitness facility, a restaurant and bar, an extremely active membership, and possibly one of the best locations around. Located directly across from the Promenade in Bonita Springs, you have shopping, dining, and entertainment within walking distance. Coconut Point mall is a short 10 minute drive, as well as The Shops at Mercato, which are right down the road. Lastly, the beautiful waters of the Gulf of Mexico are only four miles away. A lovely condo, in a beautiful community, in a spectacular location. Come see what this condo and Highland Woods has to offer. Terrace I Highland Woods Condos: C.15792 - Golf Course Condo with a ‘beachy’ feeling that will make you smile every time you walk through the front door! You will love this 2-bedroom, 2 bath unit on the 3rd floor with its screened balcony with forever views. Cozy breakfast nook overlooking the course and lakes, plantation shutters and an elegant master suite which is a perfect retreat. Immaculately cared for and warmth that is hard to find at this price! You are surrounded by beaches, shopping, restaurants and more - this could not be a better location. Highland Woods is cleverly tucked away and is truly a hidden gem. As a ‘bundled golf community’, golf and all the other amenities are included as part of your association fees. Don’t golf? Not a problem! There is bocce, tennis, swimming, cards, dancing, exercise facilities and many other community functions going on every day in the newly renovated Clubhouse, community rooms and Fitness Center. You will not be disappointed! Please let me show you the best in life starting today! Heathermoor Highland Woods Condos: Here is a beautiful two bedroom and two bathroom Heathermoor condo in the gated bundled golf community of Highland Woods. Well appointed this unit has tile floors throughout, crown molding, quartz countertops in the kitchen and bathrooms, white shaker cabinetry in the kitchen and bathrooms, stainless steel appliances, golf course views, and much much more. Located just off the first tee you are very close to the club and everything Highland Woods has to offer. Eighteen holes of championship golf, three bocce courts, four tennis courts, a large community pool with cabana, a state of the art fitness facility, and a gorgeous clubhouse with dining and grill rooms. 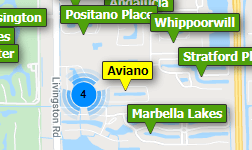 Highland Woods is centrally located and close to everything you look for while being down here in southwest Florida. Directly across the street is the Promenade of Bonita Springs. Coconut Point Mall and the Shops at Mercato are right down the road. Last but certainly not least is the Gulf of Mexico, which is only four miles away. Schedule your showing today and come take a look at what paradise looks like before its too late. Terrace I Highland Woods Condos: Property Information: Here is a fantastic opportunity to own a beautiful, turnkey-furnished Ashbury model condo on the top floor overlooking the 8th fairway, 9th fairway, 18th fairway, and the big lake of Highland Woods Golf & Country Club. Not only is the view spectacular, upgrades include wood floors, new stainless steel appliances, new carpet, updated fixtures, and electric storm shutters. Community amenities include an updated clubhouse with a dining room and grill room, a Gordon Lewis designed championship golf course, hard-thru tennis courts, seven pools, a state-of-the-art fitness center, three bocce courts and social events almost daily. Activities include weight programs, pilates, yoga, water aerobics, bridge, mah-jongg, bocce leagues, tennis leagues, and mens and womens golf leagues. Located in the heart of Bonita Springs, you have access to shopping, dining and entertainment direct across the street at the Promenade. RSW airport is a short 20 minute drive away. Last but not least are the crystal clear waters of the Gulf of Mexico, which are only four miles away. This is what the Florida lifestyle is all about; golf, sun, and fun! Schedule you showing before its too late. Terrace I Highland Woods Condos: Here it is! This lovely two bedroom two bath condo it the bundled golf community of Highland Woods is the perfect place to call home. Light, bright, and airy this unit is a blank slate and can be your dream condo. The a/c and hot water heater have been replaced, so you don't have to worry about something failing if you aren't home. The condo also makes for a wonderful rental if that is something you might be interested in. Highland Woods itself is a fantastic bundled golf community. Eighteen holes of championship golf, three bocce courts, four tennis courts, a large community pool with cabana, a state of the art fitness facility, and a gorgeous clubhouse with dining and grill rooms. Highland Woods is centrally located and close to everything you look for while being down here in southwest Florida. Directly across the street is the Promenade of Bonita Springs. Coconut Point Mall and the Shops at Mercato are right down the road. Last but certainly not least is the Gulf of Mexico, which is only four miles away. Schedule your showing today. Heathermoor Highland Woods Condos: One of the best locations in Highland Woods with this FIRST FLOOR CONDO that has been HIGHLY UPGRADED with Granite, Wood look Tile flooring, updated Bathrooms and Kitchen. Offering a serene tee box golf course location with Southern Exposure for maximum sunlight and colorful and expansive landscape views from your large corner lanai. If you are a golfer, this bundled golf community condo is for you. Enjoy a sandwich from the grill or feast in elegance with fine dining in the Newly remodeled clubhouse with one of the finest chefs in SW FL. Get or stay active with a newly upgraded golf course, bocce ball courts, tennis courts, and tons of social activities and other things to do! The A/C is new as of 2012. You can walk to the clubhouse from this location! This gated community is carefully manicured and tucked away in one of Bonita Springs prime locations. Directly across the street is the Promenade Shops with great restaurants and shopping. Up the road is Coconut Point Mall with 32 restaurants and outdoor shopping at its best! Only 4 miles gets you to world famous beaches, and close to the many medical facilities Bonita Springs offers. Come and enjoy your condo!